The huge steel mills that once lined Pittsburgh's Allegheny and Monongahela Rivers are long gone. Instead of tall belching smokestacks, the riverbanks are now dotted with cranes and new mixed-use buildings that cater to "cake-eaters" - the local term for white-collar professionals - drawn to the new offices, shops and condominiums. With cleaner air and water, downtown Pittsburgh has also attracted many companies formerly based in the suburbs that now contribute to this vibrant riverside renaissance. One such company is known for outfitting both the mill "hunks" as well as young cake-eaters who enjoy affordable, laidback weekend wear: American Eagle bought a 186,000-square-foot building in the up-and-coming SouthSide Works development. 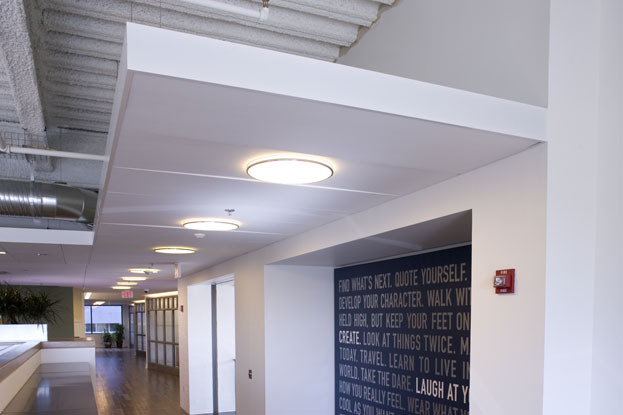 The company moved its headquarters from suburban Warrendale to the new riverfront location, 77 Hot Metal Street, to enjoy city views and a walking trail connecting to restaurants and shops nearby. 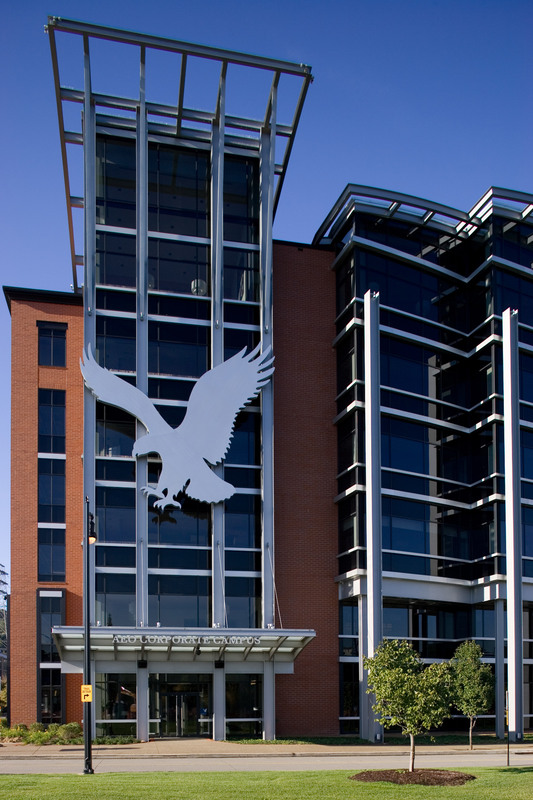 They tapped The Design Alliance, a local firm known for work with brand-conscious corporations like Heinz and Alcoa, to extend the youthful, energetic demeanor of American Eagle's clothes to its office interiors. "We were very careful about ensuring openness and transparency in the design, using vistas and glass so the company could see itself in action at all times," says Martin Powell, president of the 50-person design firm. "Basically we used the principles of store design, such as good lighting and surfaces that make sense for the brand." 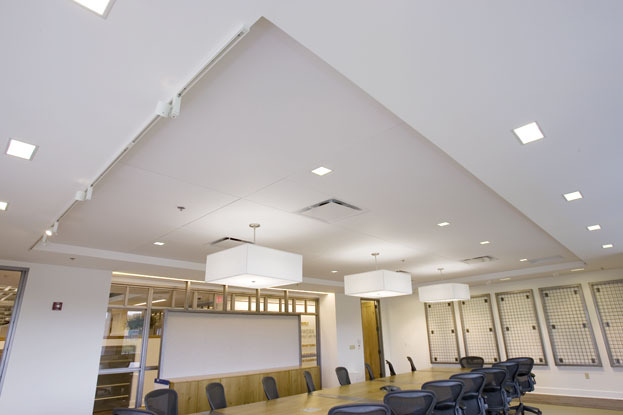 Among those surfaces were 2x6 and 4x4 Techstyle® acoustical ceilings from Hunter Douglas, which lent a smooth, clean look suggesting the bright white cottons American Eagle uses in its shirts. 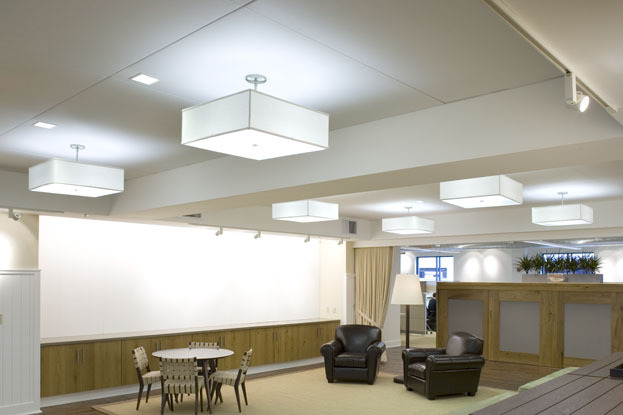 Also similar to working on a department store interior, the design team had to focus carefully on color choices. "The president and chief marketing officer of American Eagle were involved heavily, and they are very skilled at working with color," Powell recalls. "We spent hours on hue value and intensity, and developed a palette that echoes clothing colors and patterns, from the white ceiling and natural concrete and woods to the khaki beige of the carpets and the sophisticated blue and complex taupe of the paints." 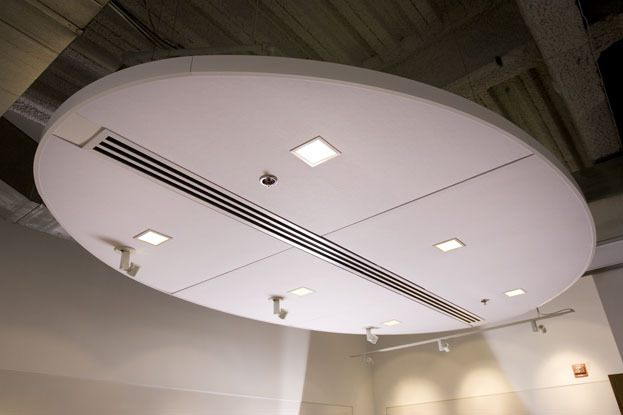 Some of the materials, in fact, were taken directly from the company's retail fit-outs. 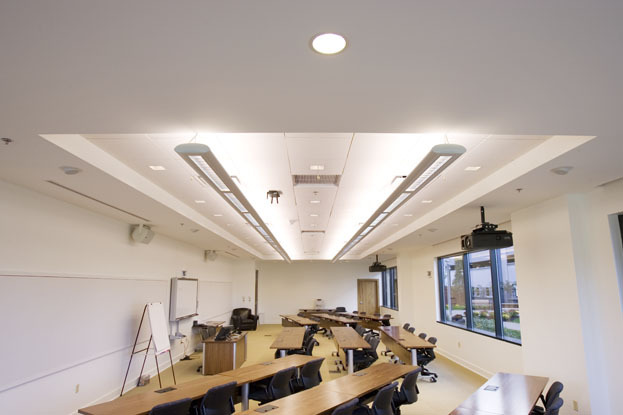 That meant creating an interior architecture with flexibility built in, Powell adds. "The ephemeral nature of fashion was part of the challenge, so we were very careful to make the fashion-oriented colors impermanent, as opposed to the oak and walnut surfaces that would be durable and last a long time." At the same time, as part of its corporate mission and appeal, American Eagle was also very interested in sustainable design. 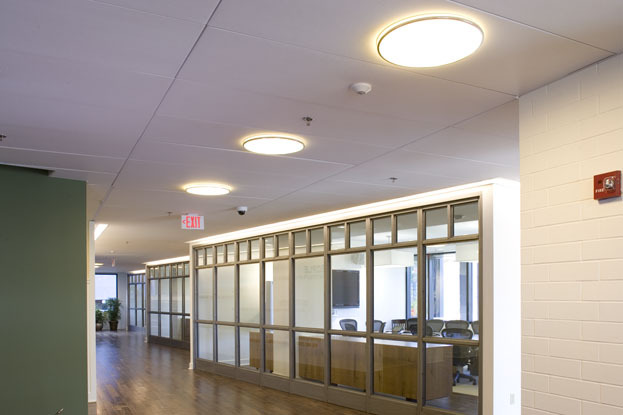 The Techstyle ceilings were among the finishes that would remain a permanent feature of the headquarters. 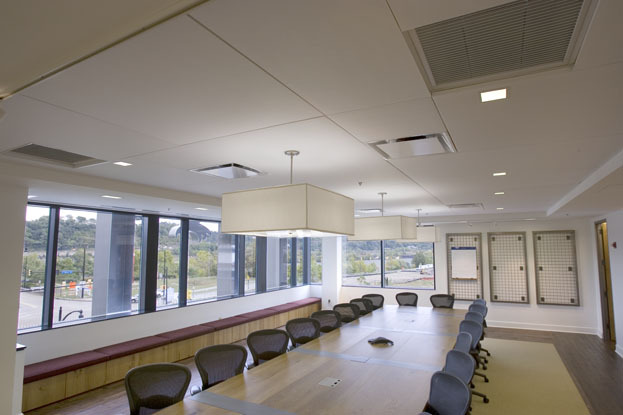 They were used throughout many public areas and enclosed offices, as well as in high-traffic and gathering spaces such as conference rooms. 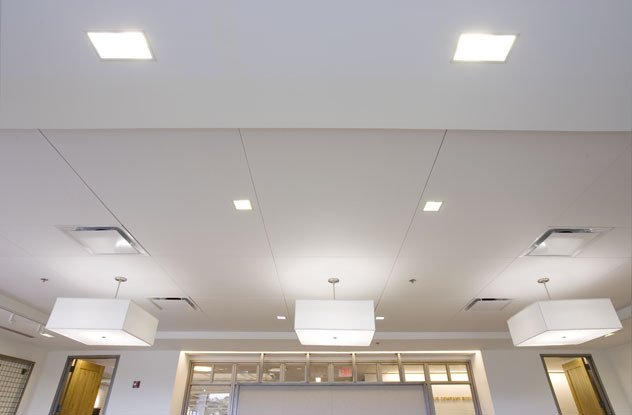 "We liked the texture and color of the white ceilings - it's a very sophisticated surface with wonderful acoustical and visual characteristics, so it works well and looks good," Powell says. "And that's very consistent with the image of a clothing company that needs to provide comfort and fashion at the same time." The panoramic vistas of the river enjoyed throughout the offices are undoubtedly pleasing to the iconic retailer, which "spent seven years agonizing over where to put a new headquarters," according to the Pittsburgh Post-Gazette. 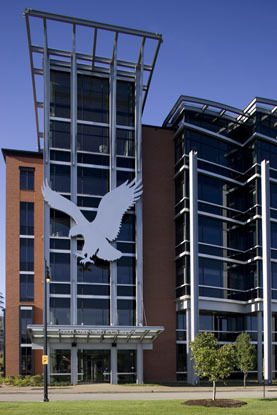 The company looked seriously at New York City, as well as several other local sites, carefully assessing whether the location would "make a difference in attracting and retaining talent," said American Eagle president Susan McGalla in an interview. The former steel mill site, SouthSide Works, had caché and a nearby nightclub scene; plus it was close to most employees' homes. National focus groups conducted to select the final site confirmed their hunch: No matter that the adjacent Hot Metal Bridge no longer carried any hot metal - instead, it carried happy young professionals, many on bicycles. 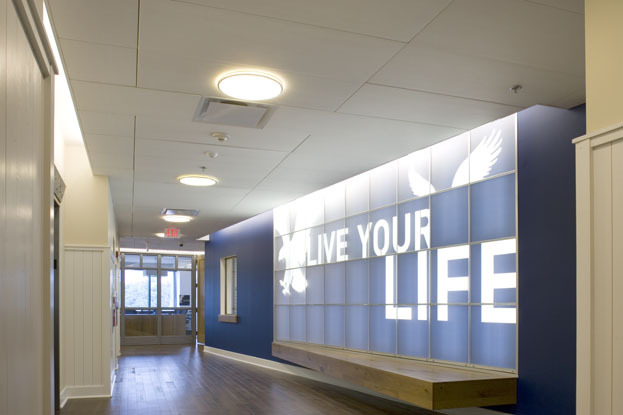 The location and each element of the interior contributes to a dynamic and casual work environment that also reflect American Eagle's message and image. Beyond being green, the company believes in authenticity, wholesomeness and outdoor-oriented lifestyles, themes that underlie all its clothing brands - even those targeting an older demographic. "It's a continuation of the genuineness and energetic feel, for people who are as comfortable outdoors as they are indoors," says Powell.